Cricket is a team sport played between two teams of eleven players each. It is a bat-and-ball game played on a roughly elliptical grass field, in the centre of which is a flat strip of ground 22 yards (20.12 m) long, called a pitch. At each end of the pitch is a set of wooden stumps, called a wicket. A player from the fielding team (the bowler) propels a hard, fist-sized cork-centred leather ball from one wicket towards the other. The ball usually bounces before reaching a player from the opposing team (the batsman), who defends the wicket from the ball with a wooden cricket bat. Another batsman (the "non-striker") stands in an inactive role near the bowler's wicket. Generally, the batsman attempts to strike the ball with the bat and run to the other end, exchanging places with his partner, scoring a run. However, he can attempt to run without hitting the ball, and vice versa. While the batting team scores as many runs as it can, the bowling team returns the ball to either wicket. If the ball strikes a wicket with enough force to knock a bail off before the batsman nearer to that wicket has reached safety, then the batsman is out, or "dismissed". The batsman can also be out by failing to stop the bowled ball from knocking the bails off, or if a fielder catches the ball before it touches the ground. Once the batsmen are not attempting to score any more runs, the ball is "dead" and is bowled again. Once out, a batsman is replaced by the next batsman in the team. As there must always be two batsmen on the field, the team's innings ends when ten batsmen are out, and the teams exchange roles. The number of innings, and possible restrictions on the number of balls in each, depend on the type of game played. At the end of the match — of which there are several definitions — the team that has scored more runs wins. In first-class cricket, a draw can result if the team to bat last fails to match the required total before a time limit is reached. This can add interest to one-sided games by giving the team in the worse position an incentive to play for a draw. This is distinct from a tie, which results if scores are level at the completion of both teams' innings. 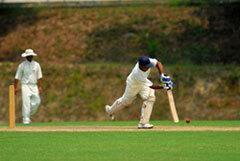 Cricket has been an established team sport for several centuries. It originated in its modern form in England and is popular mainly in the present and former members of the Commonwealth. In some countries in South Asia, including India, Pakistan, Bangladesh, and Sri Lanka, cricket is by far the most popular sport. Cricket is also a major sport in England and Wales, Australia, New Zealand, South Africa, Zimbabwe and the English-speaking countries of the Caribbean, which are collectively known in cricketing parlance as the West Indies. There are also well established amateur club competitions in countries as diverse as the Netherlands, Kenya, Nepal, and Argentina (see also: International Cricket Council). The length of the game — a match can last six or more hours a day for up to five days in one form of the game — the numerous intervals for lunch and tea and the rich terminology are notable aspects that can often confuse those not familiar with the sport. For its fans, the sport and the intense rivalries between top cricketing nations provide passionate entertainment and outstanding sporting achievements. It has even occasionally given rise to diplomatic outrage, the most notorious being the Basil D'Oliveira affair which led to the banning of South Africa from sporting events. Other examples include the Bodyline series played between England and Australia in the early 1930s, or the 1981 underarm bowling incident involving Australia and New Zealand.